A simple glaze made with a few storecupboard ingredients gives these vegetables a tasty twist. Preheat the oven to 220C, gas mark 7. Place a roasting tray in the oven to heat up. 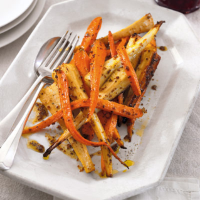 Meanwhile, slice the carrots and parsnips lengthways into halves or quarters so that they are evenly sized. 2 In a large bowl, whisk together the olive oil, honey and mustard. Add the vegetables to the bowl and toss thoroughly to evenly coat in the glaze. Place on the hot tray and roast for 30 minutes until the vegetables are tender and caramelised. On Christmas Day, cook these at the last minute, when the turkey is resting and the roast potatoes are nearly done.